Last week, I reviewed the movie, Old Fashioned, which came out on the 16th of June. This week, I have the chance to talk about a couple books related to the movie, and to do a giveaway. 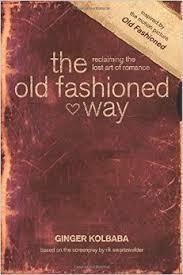 Old Fashioned, by Rene Getteridge, is a novelization of the movie. Gutteridge did a fabulous job with this! We really enjoyed the movie, but like always happens with a book, the novelization gives more detail. That meant that even though I already knew the plot, there still was some fun in reading the book, as I certainly learned more about what made both of the main characters tick. And more about some of the supporting characters as well. I might have liked that part the best. In addition, I received a devotional, The Old Fashioned Way: Reclaiming the Lost Art of Romance. I wasn't sure what I'd think of this, but I have been reading a daily reading every day (there are forty of them) and I really do like this. It isn't in-your-face about any "one right way" types of things, but is definitely designed to get you to think about what your boundaries are, and what is (or isn't) healthy. I have an Old Fashioned Package to give away! It includes the movie, the novelization, and the devotional. US and Canada only, please. This would be an interesting watch & read for us to use w/ our 17 year old daughter, and maybe some of her friends from church. I am such a Rene Gutteridge fan! Have you read her homeschooling series? So hilarious. And edifying. Based on your review, this sounds like a book that would fit nicely into our family library. I have never read anything by Rene Gutteridge, so it would be a pleasure to be introduced to a new author. This looks like a movie I would like to see and share with family members.